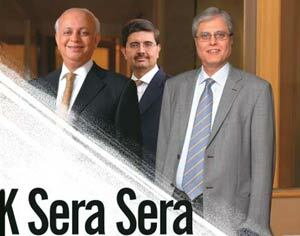 For three decades, the three Ks—Kothari, Kampani and Kotak—ruled The Street. Today, Kothari has hung up his gloves, Kampani is in the eye of a storm and Kotak is building a bank—ending an era of home-grown dealmakers. Rachna M. Koppikar goes into the details. A former banker with ICICI Securities (I-Sec) recollects how, on more than one occasion, his team was in grave danger of losing a mandate because the corporate honchos they would meet all had a singular gripe. “You guys are good but you don’t have a K factor in your firm,” they would shrug. The K factor, of course, alluded to any of the three stalwart dealmakers of India—Hemendra Kothari, Nimesh Kampani and Uday Kotak. Such a grievance would exasperate the I-Sec banker— until sheer desperation resulted in him hitting upon a simple solution. The next time he was confronted with the “but-you-don’t-have-a-K” line, the I-Sec dealmaker triumphantly retorted: “Oh, yes but we do have a K!” At the next meeting with the same client, the I-Sec team had in tow another member— K.V. Kamath, Managing Director & CEO, ICICI Group. That’s the kind of aura the Ks commanded for over three decades on Dalal Street. If they weren’t at the forefront of the biggest capital market transactions, they were busy sealing big-bang mergers & acquisitions for the who’s who of India Inc. If the Tatas, Ambanis, Birlas— to name just three of the biggest family-run businesses—needed advise on capital-raising or business restructuring, one of the Ks was inevitably at hand. Till the early 2000s, Kothari, Kampani and Kotak handled half of the transactions that took place in the Indian market. Along the way, the three Ks also focussed on institutional building, by allying with the best on Wall Street— Kotak with Goldman Sachs, Kampani with Morgan Stanley and Kothari with DSP Merrill Lynch. As ideas and research came into the picture, the men with the relationships now also had to focus on building teams. And they did just that. Eventually, the Wall Street banks carved their own presence in the country. Last month, Kothari bid adieu to the institution he founded when he sold his remaining 10 per cent in DSP Merrill Lynch to its new parent, Bank of America (earlier in 2005, he had sold 47 per cent to DSP Merrill Lynch). Kampani, for his part, is there at the helm of his firm, JM Financial, which, till 2007, had two joint ventures with Morgan Stanley, but finds himself in trouble with the law; this has forced him to operate out of Dubai since the beginning of this year. The third K, Uday Kotak, has shifted gears, and it is building a commercial bank that’s his top priority now; cutting mega-deals, like the acquisitions of Aircel by Hutch Essar or Bazee.com by eBay, are glories of the past. To the credit of these three gentlemen, it must be said that they’ve built institutions that extend beyond their larger-than-life personas. JM, for instance, is running smoothly, despite the physical absence of its promoter, Kotak has a core A team to handle the investment banking division and DSP Merrill Lynch has built on the foundation laid by Kothari. Yet, for these home-grown veteran houses, including others like Vallabh Bhansali’s Enam Financial, competition from their US counterparts is at its severest, their global woes notwithstanding. Commercial banks like UBS, HSBC and Citi have been busy grabbing mandates from multinationals and of late, even Indian promoters seem to prefer them. And the erstwhile investment banks like Goldman Sachs and Morgan Stanley would like to look at India (along with China) as the sweetest spot in their global portfolio (see Banking on India, page 60). When Kothari called it a day, a few former colleagues termed it “the end of an era”. “I am proud of leaving behind one of the best teams in the country,” Kothari told BT. The big question, though, is: Will the talent, which he nurtured for all these years, stay as Bank of America muscles its way back? In fact, soon after Kothari sold part of his stake to DSP Merrill Lynch in 2005, senior investment bankers, who had honed up their skills under him, left the firm for greener pastures. Kampani may also face a problem of talent-retention, albeit for totally different reasons. In January, the Andhra Pradesh police issued a warrant against him and other former directors of Nagarjuna Finance for its failure to repay depositors. Since then, Kampani has been out of the country and recently managed to get a stay order against his arrest. This unsavoury episode comes on the heels of some serious setbacks. Quips Pramit Jhaveri, Head (Global Banking), Citi South Asia: “To fulfill their aspirations of growth and international presence, Indian corporates prefer working with investment banks like Citi, which follow an institutional approach and have the desired expertise, global reach and offer a comprehensive portfolio of financial solutions, both in terms of products and advisory.” When Citi plunged into investment banking in 2000, sceptics didn’t expect it to make a dent in the monopoly of the three Ks. Citi did that, and more (see box Few Ks on D-Street). Indeed, family businesses, which hitherto almost blindly called up the K-bankers till a few years ago, are opting for foreign banks—even in the domestic market. The Aditya Birla Group, which is known to have worked with DSP Merrill Lynch for a large number of its domestic transactions, recently appointed UBS for selling its insulator business. Similarly, DLF, which went public with the help of eight bankers, appointed Ernst & Young to advise on selling its wind turbine business. The cashstrapped Wockhardt, too, has appointed UBS to help it raise funds through private equity and for the sale of some of its business units. Adds S. Mahalingam, CFO, Tata Consultancy Services (TCS): “A local player has a great advantage of having access to a wide network. But then it’s the promoter who becomes the critical element in dealing with the firm.” Today, CEOs have plenty on their plate and prefer to delegate capital market and M&Arelated matters to the CFO and corporate finance team. “Companies can’t really count on relationships with bankers only. They need to work with institutionalised players as delivery and execution is the most crucial element,” says Ashutosh Agarwala, CFO, GMR Group. That, in essence, is the difference between the old generation and the new—and between K-banking and today’s world of I-banking.